USATriathlon (USAT), International Triathlon Union (ITU), U.S. Masters Swimming and IRONMAN Certified Coach. Coaching starts at $50/month and includes (but not limited to): Video Analysis (underwater and dry-land), Swim Technique and Form, Nutrition planification, weigh loss/control. Athlete Progress Monitoring (Initial and mid/training assessments/ Training Periodization). Coaching Local and Remote Athletes. 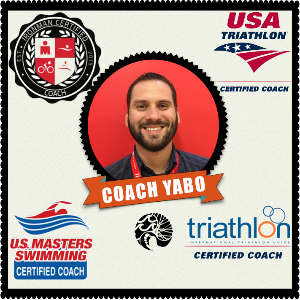 USAT level 2, ITU, U.S. Masters Swimming level 2 and IRONMAN certified coach with over 24 years of experience in competitive sports, strong swimming background, high level of experience in remote coaching and head coach of UnderDog Triathlon (USAT certified club) Puerto Rico and Colombia. Head Coach of Run Like A Lola Puerto Rico running team. Fully bilingual ( Español and English), actively coaching athletes (runners and triathletes) remotely in Cartagena Colombia, Nashville Tennessee, Washington DC and Victoria Texas. Coaching in person at Caguas Puerto Rico and San Juan Puerto Rico. Believer and supporter of “Quality over quantity”. Have the experience and education to serve you and help you achieve your goals and aim to your maximum potential injury and risk free. Computer/Tablet or Smart Phone for data upload and Heart Rate Monitor is a MUST for remote Athletes, not for locally coached athletes but its a plus. Power Meter is a plus, but not required. Success. Coach Yabriel Aviles has been notified of your message.